I've been tempted many times to put this on a billboard with the caption, "not your Grandma's Bed and Breakfast"! The Arcadian Inn and many Inns like it could certainly be said to be the influence towards "boutique" hotels. Boutique hotels are normally historic buildings turned into luxury accommodations. Hm-m-m. Did it all start with Innkeepers that turned historic homes into luxury accommodations. 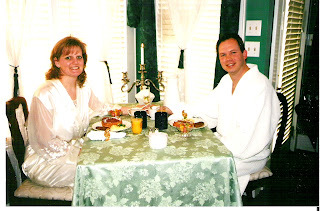 A Better Way to Stay - Bed and Breakfasts have come along way. A popular TV talk show host bashed B&Bs saying he hated eating with everyone. Here at the Arcadian Inn, we pride ourselves in that we want to serve you privately in your room! We don't want to break the mood by making you get up early, get beautiful to sit with other people and make conversation. It's all about the Two of you. Here at the Arcadian Inn, we have many special touches that you can add to your stay. Your Arcadian Inn getaway is waiting for you with your needs and expectations first on our minds. Take a moment to visit our website and "shop" for your next getaway. I also really enjoy these posts. You bring attention to your way that you docarate for the Bed and Breakfast and their details that may otherwise go unnoticed. Thank you for sharing.